Are you interested in a brighter smile? Soft Touch Dentistry proudly offers advanced teeth whitening to the residents of O'Fallon and the surrounding St. Louis areas. We are a family dental practice that delivers state-of-the-art preventative, restorative and cosmetic dental care in a caring, stress-free environment. Dr. Sarah Thompson leads our team as skilled and reputable cosmetic dentist who is passionate about enhancing smiles. Our teeth whitening procedures can dramatically improve your smile appearance and give you the confident look you desire. 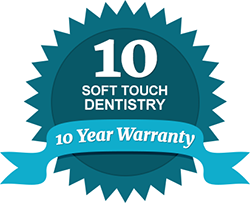 Soft Touch Dentistry offers both ZOOM teeth whitening as well as home teeth whitening systems that can significantly lighten your smile and reverse a dingy or yellow look. Our ZOOM technology is a safe, effective and cutting-edge system that can whiten your teeth in the comfort of our dental office in just under an hour. This procedure uses a combination of a hydrogen peroxide gel and a specially designed ultraviolet lamp to lighten the color of your teeth. It involves three fifteen-minute sessions under the lamp followed by a five-minute fluoride treatment. The result is often teeth that are between six and ten shades whiter! For patients who prefer to do their teeth whitening at home, yet get professional results, we also offer custom trays and prescription strength whitening gel. Regardless of the method you choose for your professional whitening, Dr. Thompson will monitor your treatment closely and help you gain the final results you desire. Our practice always utilizes the latest in dental technology and we make your comfort our priority. We have many options in sedation dentistry and we offer relaxing music, blankets and TV screens to keep you comfortable and at ease during your procedures. From professional teeth whitening to porcelain veneers and Invisalign, Soft Touch Dentistry has everything you need to transform your smile. Our practice accepts most dental insurance carriers and we offer flexible financing plans for your benefit. If you are ready to address your dull smile or stained teeth, contact us today to discover how much brighter we can make you smile!